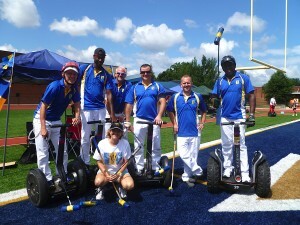 The Barbados Segway Polo team in Washington – (from left) James de Gale, Nevin Roach, Brett deGale, Brett Callaghan, Ralph Luther and David Eastmond. Barbados were losing finalists in the recent Segway Polo World Cup in Washington DC, United States, but continue to be a rising force in the international sport. The Barbadians were defeated 2-1 in the final, in extra-time, by the Stockholm Saints of Sweden after reaching the playoff with convincing victories along the way. Nevin Roach scored the lone goal for Barbados in the final. Barbados previously won the Woz Challenge Cup, regarded as the World Cup of Segway Polo, in 2009 and 2010 and were second in 2011. This year’s performance also meant that it was the fourth time in five years that the Barbados team, supported by Nissan, reached the final. In round-robin play among nine teams in Washington, Barbados recorded four wins, two draws and two losses and went on to beat Stockholm Vikings of Sweden (2-0) in the quarterfinals and the Blade Allstars of Germany (2-1) in the semifinals. Members of Team Barbados were — David Eastmond, Nevin Roach, Brett de Gale, James de Gale, Brett Callaghan and Ralf Luther. Also in attendance at the finals for the first time was the president of Segway Inc. Rod C. Keller, Jr. who assured players that Segway Inc. would step up its support for the sport. The trip of the Barbados team to Washington DC was supported by the Segway Polo Club of Barbados, the Barbados Tourism Authority, Nissan Barbados and Courtesy Garage and Totally Barbados.